#A079 Primitive 2 Needle Knitted Mittens with Heart Appliques, Buttons Design Pattern! Primitive two needle knitting pattern and applique instructions for mittens Pattern size is for ladies or children 12-14. #A078 Primitive 2 Needle Knitted Mittens with Star Appliques, Buttons Design Pattern! Pattern and applique design instructions for 2 needle knitted mittens. Pattern size for ladies or children 12-14. #A077 Primitive 2 Needle Knitted Mittens with Mitten Appliques, Buttons Design Pattern! Pattern and instructions�on applique design for 2 needle�knitted mittens. Pattern size is for ladies or�children 12-14. 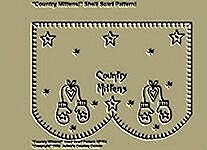 #A251 Primitive Stitchery Pattern, "Country Mittens!" Shelf Scarf Pattern! Primitive Stitchery Pattern �Country Mittens!� Shelf Scarf Pattern!� This Shelf Scarf Pattern can be used to decorate shelves, for Candle Mats, or Bread Clothes to line Baskets. For larger shelves you can place more than one Shelf Scarf side by side each other. Measures 5 �� x 7 7/8�.